Allergic reactions are of increasing concern to practitioners in health-related fields. As patient susceptibility increases, the need for basic understanding and successful management of these conditions are of primary importance. An allergic response is one in which certain components of the immune system react excessively to a foreign substance. Allergy in patients undergoing orthodontic treatment can be seen due to several reasons and these include nickel allergy, allergy to the acrylic resins that are used during treatment, latex products, etc. A large variety of metallic alloys are routinely used in dentistry. Allergy as a possible factor has also been implicated in root resorption and hypo-dontia. Gold was used in orthodontics for fabrication of accessories until the 1930s and 1940s. In 1929, stainless steel was used for the first time to replace gold. Several metallic alloys are used in orthodontics, such as cobalt-chromium, nickel-titanium, β-titanium, among others; the majority of these alloys have nickel as one of their components. The percentage of this metal in the alloys varies from 8%, as in stainless steel, up to more than 50%, as in nickel-titanium alloys. The aim of this paper is to review and analyze critically the current available literature in the field of allergy in orthodontics and to provide clinical implications based on scientific evidence on the topic. A search was conducted on PubMed to retrieve all available literature on allergy and orthodontics. The search revealed a total of 114 articles on the topic. A total of 106 articles were retrieved in nickel allergy and orthodontics. Of these, 14 articles were reviews on nickel allergy and 92 were case reports. Four reviews were in languages other than English. These articles were eliminated and 10 articles were studied. Five articles were in relation to allergy and root resorption, and three were in relation to allergy and hypo-dontia. Park and Shearer  reported an average release of 40 μg of nickel and 36 μg of chromium from a simulated orthodontic appliance. The release of nickel is not necessarily related to the alloy's nickel content. The amount of nickel release can increase during stress. The quantities released may be negligible from a toxicological point of view, but might conceivably be of significance for patients with a high degree of hypersensitivity to nickel. Fors and Persson  found significantly higher content of nickel in the plaque and saliva of patients with orthodontic appliances compared with non-orthodontic patients. Moreover, in orthodontic patients, significantly higher nickel content was found in plaque from metal surfaces (band and brackets) than from enamel surfaces. Clinical abnormalities, such as gingivitis, gingival hyperplasia, lip desquamation, multiform erythema, burning sensation in the mouth, metallic taste, angular cheilitis, and periodontitis, may be associated with release of nickel from orthodontic appliances. ,,,, These reactions are associated with an inflammatory response induced by corrosion of orthodontic appliances and subsequent release of nickel. It is manifested as Nickel Allergic Contact Stomatitis (NiACS). A burning sensation is the most frequent symptom. The aspect of the affected mucosa is also variable, from slight erythema to shiny lesions, with or without edema. Vesicles are rarely observed, but when they are present, they quickly rupture, forming erosion areas. In chronic cases, the affected mucosa is typically in contact with the causal agent and appears erythematous or hyper-keratotic to ulcerated. Other symptoms can also be present, such as peri-oral dermatitis and, rarely, orolingual paresthesia. People with cutaneous piercing were considered a significant risk factor for Ni allergy. Scientific evidence suggests that orthodontic treatment is not associated with increase of Ni hypersensitivity, unless patients have a history of previous cutaneous piercing exposure to Ni, usually ear piercing. Previous allergic history has been significantly associated by several authors to a hypersensitivity response to nickel released from orthodontic appliances. Gursoy et al. in 2007 found that low-dose continuing nickel release from orthodontic appliances might be the initiating factor for gingival overgrowth, as it has the capability of increasing epithelial cell proliferation. Pazzini et al. in 2011 found that patients treated with conventional braces exhibited greater periodontal alterations than those treated with nickel-free braces. Individuals with an allergy to nickel exhibit better periodontal health when treated with nickel-free braces than with conventional braces. Pazzini et al. found that nickel can influence the condition of the periodontal and blood cells of allergic orthodontic patients, but with reactions of an inflammatory, rather than allergic nature. 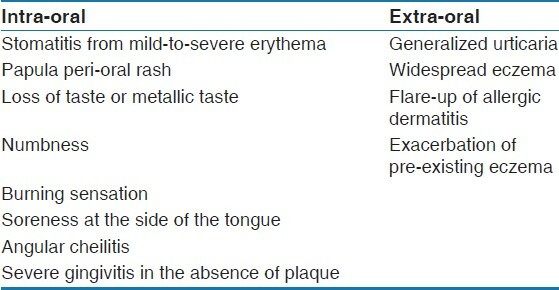 Confined extra-oral rash adjacent to headgear studs. A dermatologist should confirm the diagnosis by patch testing using 5% nickel sulfate in petroleum jelly. The majority of investigations have found that nickel-sensitive patients are able to tolerate stainless steel without any noticeable reaction. Most research concludes that stainless steel is a safe material to use for all intra-oral orthodontic components for nickel-sensitive patients. Alternatives to Ni-Ti include twistflex stainless steel and fiber-reinforced composite archwires. Wires such as TMA, pure titanium, and gold-plated wires may also be used without risk. Altered nickel-titanium archwires also exist and include plastic/resin-coated nickel-titanium archwires. Ion-implanted nickel-titanium archwires have their surface bombarded with nitrogen ions, which forms an amorphous surface layer, conferring corrosion resistance and displacing nickel atoms, and decreasing the risk of an allergic response. Extra-oral metal components, including metal studs in headgear, are of greatest concern due to greater sensitivity of skin. Plastic-coated headgear studs may be a better alternative for such patients. Root resorption is a common sequel to orthodontic treatment and has been recorded in 93% of treated adolescents. Davidovitch et al. hypothesized that individuals who have medical conditions that affect the immune system may be at a high level of risk for developing excessive root resorption during the course of orthodontic treatment. In reviewing orthodontic patient records at the University of Oklahoma, they discovered that the incidence of asthma, allergies and signs indicative of psychological stress were significantly higher in patients who had experienced excessive root resorption during orthodontic treatment as compared with the group of orthodontic patients who had completed their course of treatment without suffering this unfortunate outcome. McNab et al. reported that the incidence of external apical root resorption was elevated in patients with asthma. However, both asthmatics and healthy patients exhibited similar amounts of moderate and severe resorption. Nishioka et al. found that allergy and asthma might be an etiological factor in excessive root resorption. The same association was found in earlier studies. ,,,, Owman-Moll and Kurol  also suggested that there might be a link between allergy and the extent of root resorption, but no statistically significant difference was found. Nishioka et al. strongly supported the hypothesis that allergy and asthma may be high-risk factors for development of excessive root resorption during orthodontic treatment. They concluded that allergy, root morphology abnormalities and asthma may be considered high-risk factors for development of excessive root resorption during the course of orthodontic treatment in a Japanese population. Three articles were retrieved in the search and only one article dealt with allergy in relation to hypo-dontia. Third molars are the most commonly missing teeth followed by the second premolars and the maxillary lateral incisors. The etiology of hypo-dontia is considered to be multifactorial, with genetics and environmental factors playing an important role. Yamaguchi et al. in 2008 studied 3683 Japanese orthodontic patients and found positive correlation between allergy and hypo-dontia. They concluded that health problems, especially those related to allergy, are of importance and could be strongly related to hypo-dontia. Safe and effective practice depends on identifying patients with allergy along with knowledge of materials that can potentially cause them. It is imperative for a practitioner to not only know the physical and mechanical properties of the materials being used, but also of the biologic compatibility of the material. Knowledge of alternatives to allergy-causing materials is also of prime importance in efficient management of patients in routine clinical practice. 2. Namikoshi T, Yoshimatsu T, Suga K, Fujii H, Yasuda K. The prevalence of sensitivity to constituents of dental alloys. J Oral Rehabil 1990;17:377-81. 3. Counts AL, Miller MA, Khakhria ML, Strange S. Nickel allergy associated with a transpalatal arch appliance. J Orofac Orthop 2002;63:509-15. 4. McDonagh AJ, Wright AL, Cork MJ, Gawkrodger DJ. Nickel sensitivity: The influence of ear piercing and atopy. Br J Dermatol 1992;126:16-8. 5. Park HY, Shearer TR. In vitro release of nickel and chromium from simulated orthodontic appliances. Am J Orthod 1983;84:156-9. 6. Grimsdottir MR, Gjerget NR, Hensten-Pettersen A. Composition and in vitro corrosion of orthodontic appliances. Am J Orthod Dentofac Orthop 1992;101:525-32. 7. Fors R, Persson M. Nickel in dental plaque and saliva in patients with and without orthodontic appliances. Eur J Orthod 2006;28:292-7. 8. Fischer LA, Menne T, Johansen JD. Experimental nickel elicitation thresholds-a review focusing on occluded nickel exposure. Contact Dermatitis 2005;52:57-64. 9. Emmett EA, Risby TH, Jiang L, Ng SK, Feinman S. Allergic contact dermatitis to nickel: Bioavailability from consumer products and provocation threshold. J Am Acad Dermatol 1988;19:314-22. 10. van Loon, LA, van Elsas PW, Bos J D, ten Harkel-Hagenaar HC, Krieg SR, Davidson, CL. T-lymphocyte and Langerhans cell distribution in normal and allergically-induced oral mucosa in contact with nickel-containing dental alloys. J Oral Path 1988;17:129-37. 11. Rahilly G, Price N. Nickel allergy and orthodontics. J Orthod 2003;30:171-4. 12. Janson GR, Dainesi EA, Consolaro A, Woodside DG, Freitas MR. Nickel hypersensitivity reaction before, during, and after orthodontic therapy. Am J Orthod Dentofacial Orthop 1998;113: 655-60. 13. Lindsten R, Kurol J. Orthodontic appliances in relation to nickel hypersensitivity: A review. J Orofac Orthop 1997;58:100-8. 14. Starkjaer L, Menné T. Nickel allergy and orthodontic treatment. Eur J Orthod 1990;12:284-9. 15. Lamster IB, Kalfus DI, Steigerwald PJ, Chasens AI. Rapid loss of alveolar bone association with nonprecious alloy crowns in two patients with nickel hypersensitivity. J Periodontol 1987;58: 486-92. 16. Bishara SE, Barrett RD, Selim M. Biodegradation of orthodontic appliances. Part II. Changes in the blood level of nickel. Am J Orthod Dentofacial Orthop 1993;103:115-9. 17. Genelhu MC, Marigo M, Alves-Oliveira LF, Malaquias LC, Gomez RS. Characterisation of nickel induced allergic contact stomatitis associated with fixed orthodontic appliances. Am J Orthod Dentofacial Orthop 2005;128:378-81. 18. Smith-Sivertsen T, Dotterud LK, Lund E. Nickel allergy and its relationship with local nickel pollution, ear piercing, and atopic dermatitis: A population based study from Norway. J Am Acad Dermatol 1999;40:726-35. 19. Mattila L, Kilpeläinen M, Terho EO, Koskenvuo M, Helenius H, Kalimo K. Prevalence of nickel allergy among Finnish university students in 1995. Contact Dermatitis 2001;44:218-23. 20. Schafer T, Bohler E, Ruhdorfer S, Weigl L, Wessner D, Filipiak B, et al. Epidemiology of contact allergy in adults. Allergy 2001;56:1192-6. 21. Blanco-Dalmau L, Carrasquillo-Alberty H, Silva-parra J. A study of nickel allergy. J Prosth Dent 1984;52:116-9. 22. Janson GR, Dainesi EA, Pereira AC, Pinzan A. Clinical evaluation of nickel hypersensitivity reaction in patients under orthodontic treatment. Ortodontia 1994;27:31-7. 23. Jacobsen N, Hensten-Pettersen A. Changes in occupational health problems and adverse patient reactions in orthodontics from 1987 to 2000. Eur J Orthod 2003;25:591-8. 24. Schuster G, Reichle R, Bauer RR, Schopf PM. Allergies induced by orthodontic alloys: Incidence and impact on treatment. J Orofac Orthop 2004;65:48-59. 25. Kerosuo H, Kullaa A, Kerosuo E, Kanerva L, Hensten-Pettersen A. Nickel allergy in adolescents in relation to orthodontic treatment and piercing of ears. Am J Orthod Dentofac Orthop 1996;109:148-54. 26. Thyssen JP, Linneberg A, Menne T, Johansen JD. The epidemiology of contact allergy in the general population-prevalence and main findings. Contact Dermatitis 2007;57:287-99. 27. Naranjo AA, Trivino ML, Jaramillo A, Betancourth M, Botero JE. Changes in the subgingival microbiota and periodontal parameters before and 3 months after bracket placement. Am J Orthod Dentofacial Orthop 2006;130:17-22. 28. Pazzini CA, Junior GO, Marques LS, Pereira CV, Pereira LJ. Prevalence of nickel allergy and longitudinal evaluation of periodontal abnormalities in orthodontic allergic patients. Angle Orthod 2009;79:922-7. 29. Gursoy UK, Sokucu O, Uitto VJ, Aydin A, Demirer S, Toker H, et al. The role of nickel accumulation and epithelial cell proliferation in orthodontic treatment-induced gingival overgrowth. Eur J Orthod 2007;29:555-8. 30. Pazzini CA, Pereira LJ, Carlos RG, de Melo GE, Zampini MA, Marques LS. Nickel: Periodontal status and blood parameters in allergic orthodontic patients. Am J Orthod Dentofacial Orthop 2011;139:55-9. 31. Pazzini CA, Marques LS, Ramos-Jorge ML, Júnior GO, Pereira LJ, Paiva SM. Longitudinal assessment of periodontal status in patients with nickel allergy treated with conventional and nickel-free braces. Angle Orthod 2012;82:653-7. 32. Wataha JC. Biocompatibilty of dental casting alloys: A review. J Prosthet Dent 2000;83:223-34. 33. Menné T, Brandup F, Thestrup-Pedersen K, Veien NK, Andersen JR, Yding F, et al. Patch test reactivity to nickel alloys. Contact Dermatitis 1987;16:255-9. 34. Marigo M, Nouer DF, Genelhu MC, Malaquias LC, Pizziolo VR, Costa AS, et al. Evaluation of immunologic profile in patients with nickel sensitivity due to use of fixed orthodontic appliances. Am J Orthod Dentofacial Orthop 2003;124:46-52. 35. Toms AP. The corrosion of orthodontic wire. Eur J Orthod 1988;10:87-97. 36. Kim H, Johnson J. Corrosion of stainless steel, nickel titanium, coated nickel-titanium, and titanium orthodontic wire. Angle Orthod 1999;69:39-44. 37. Kurol J, Owman-Moll P, Lundgren D. Time related root resorptions after application of a controlled continuous orthodontic force. Am J Orthod Dentofac Orthop 1996;110:303-10. 38. Davidovitch Z, Lee YJ, Counts AL, Park YG, Bursac Z. The immune system possibly modulates orthodontic root resorption. In: Davidovitch Z, Mah J, editors. Biological Mechanisms of Tooth Movement and Craniofacial Adaptation. Boston, MA: Harvard Society for the Advancement of Orthodontics; 2000. p. 207-17. 39. McNab S, Battistutta D, Taverne A, Symons AL. External apical root resorption of posterior teeth in asthmatics after orthodontic treatment. Am J Orthod Dentofacial Orthop 1999;116:545-51. 40. Nishioka M, Ioi H, Nakata S, Nakasima A, Counts A. Root resorption and immune system factors in the Japanese. Angle Orthod 2006;76:103-8. 41. Owman-Moll P, Kurol J. Root resorption after orthodontic treatment in high- and low-risk patients: Analysis of allergy as a possible predisposing factor. Eur J Orthod 2000;22:657-63. 42. Symons AL, Stritzel F, Stamation J. Anomalies associated with hypodontia of the permanent lateral incisors and second premolars. J Clin Pediatr Dent 1993;17:109-11. 43. Larmour CJ, Mossey PA, Thind BS, Forgie AH, Stirrups DR. Hypodontia-a retrospective review of prevalence and etiology. Part I. Quintessence Int 2005;36:263-70. 44. Yamaguchi T, Tomoyasu Y, Nakadate T, Oguchi K, Maki K. Allergy as a possible predisposing factor for hypodontia. Eur J Orthod 2008;30:641-4.